An adult koala is about 25-35 inches long, and weighs usually less than 30 pounds. A new born koala is less than 1 inch long. It stays in its mother’s pouch the first six months where it nurses. Since koala mostly eat eucalyptus leaves, which provide them with the water they need, they do not drink water (or rather, they rarely do). Koala Bears, Not BearsKoala bears are marsupials—which means they can carry their young in a pouch (like the kangaroo). The word bear was added to their name only because they look like teddy bears! They are not related to the bear family. No Time to PlayKoalas spend most of their day resting or sleeping (almost 20 hours each day for sleeping and resting). The rest of the time they spend eating or moving from tree to tree. They interact with other koalas very little (no social life!). 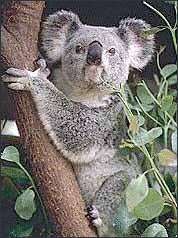 Koalas are nocturnal animals. Daytime is their sleep and rest time. Male koalas do not like the company of others, especially other males. They live alone and often fight over their territory. They mark their trees for their territory by leaving their scent on the tree. They rub their chest scent glands on the tree. Physical FeaturesTheir thick tails provide comfortable cushion for sitting on a tree branch for hours—that is, almost all the time. Each front paw has two thumb-like fingers and three other fingers allowing koalas to easily move from tree branch to the next.